Our Floridian Side Chair is built to withstand high-traffic restaurant environments, while maintaining elegant craftsmanship and contemporary flair that will add an upscale element to your outdoor dining area. With a variety of color and finish selections to choose from, you can create a look that is unique to your setting. Our wicker furniture features rust-proof aluminum frames woven with durable resin strands Appropriate for indoor and outdoor use. These chairs are also stackable making them ideal for quick and easy storage. Finish options include: Coffee or Indo Coffee. 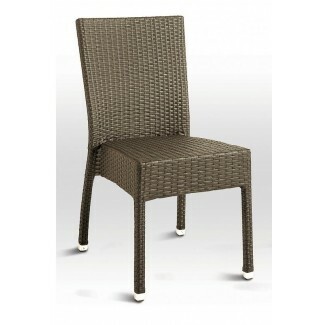 This piece in our Woven Wicker Restaurant Collection is In Stock, with a lead time of 1.5 - 2.5 weeks from the time your order is processed.